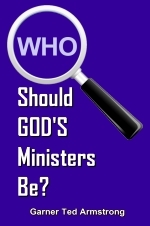 Who Should GOD'S Ministers Be? If the Bible truth were known, thousands would never have "chosen" the ministry as their profession! Should you teach, preach, or "witness" for the Lord? How does God call His true ministers? "I'VE BEEN called to preach!" said the eager young man to the elder pastor. "HOW do you know you've been called to preach?" asked the dignified old gentleman. "Well sir, I saw a vision in the sky," began the hopeful youngster, "and it seemed the initials 'P C' appeared to me. I saw them with my own eyes!" "And what do you believe the vision meant?" asked his elder. "PREACH CHRIST! " was the enthusiastic answer. At this the old gentleman sadly shook his head. "No, my son — I'm afraid you've misinterpreted your vision." "Huh?" came the quizzical reply. "Yes — you see," he said gently, "the real meaning of the vision was that you should PLOUGH CORN"! This story serves to illustrate the manner in which perhaps many sincere people decide upon the ministry as their life's work. Undoubtedly, a number of the students in the theological seminaries of this world feel they have been given a special "calling" of God to preach. Still, many others will readily admit they simply chose the ministry according to their aptitudes, much the same way a man might choose aeronautical engineering, civil service work, or farming. Perhaps some of YOU, reading this article, feel you have been given a "calling" to preach. But just what IS a CALL from God? Surely, should YOU be one who is presently teaching a Bible class, holding a study group, or in any way "witnessing" for Christ — you should want to know EXACTLY WHAT GOD SAYS ABOUT IT, shouldn't you? God DOES CALL His Ministers! It is GOD, not man, who chooses and calls His servants. Jesus said, "I will build MY Church" (Matt. 16:18). Christ DID build that Church, and is its LIVING HEAD TODAY! "Now therefore ye (Gentiles) are no more strangers and foreigners, but fellow citizens with the saints, and of the household of God; and are built upon the FOUNDATION of the apostles and prophets, Jesus Christ Himself being the Chief Corner Stone" (Eph. 2:19-20). Christ is the Head of the Church He built (Eph. 1:22, 5:23), and therefore it is CHRIST who chooses His ministers and officers. "Ye have not chosen me, but I have chosen you, and ordained you..." said Jesus to His disciples (John 15:16). "But now hath GOD set the members every one of them in the body (of Christ — the Church) as it hath pleased HIM!" (I Cor. 12:18). Just as the early beginning of the true Church of God was fraught with many dangers from ravening men — men who would KILL because of religious hatred and bigotry — so IS OUR AGE! When Jesus told His disciples of the times just before His return to the earth, He warned, "Take heed that no man deceive you" (Matt. 24:4). In His warning about deceptions, Jesus talked of false ministers who would be masquerading as true ministers of the Gospel, who would "show great signs and wonders; insomuch that, if it were possible, they shall deceive the very elect" (Matt. 24:24). This warning is about OUR TIMES — NOW! And to WHOM was the warning given? To the people of God! The students, learners — disciples of Christ! There is a very grave danger that YOU, as a "babe in Christ" could LOSE your salvation by failing to understand and heed these warnings about false ministers. These false teachers who are working right now — as you read this article — will always despise the AUTHORITY of God's TRUE MINISTERS. They will PRESUME to 'themselves a position as leader and teacher of other people. Perhaps even in all sincerity, it simply begins as a Bible study group after a broadcast — but a certain dominant personality will always arise — and oftentimes today it is a woman — and begin to teach, explain and expound to the others — WHEN THERE HAS BEEN NO CALLING FROM GOD TO DO SO! In the early Church, there arose false ministers and lay members, who began to set themselves up (note this well) as "teachers" and "leaders" of the people. The whole theme of the New Testament, from the very inception of God's true Church to the end of the book of Revelation is one of APOSTASY, one Of God's true apostles and ministers constantly struggling against FALSE DOCTRINES creeping in, and against counterfeit ministers who were trying to lead off people after themselves. God's government went into effect, and, after hearing all the facts, and certain recommendations from other leading apostles, James, the chief apostle at Jerusalem (vs. 19) rendered a binding decision, which the others delivered to the churches as an authoritative DECREE! (Acts 16:4). Almost immediately after the beginning of God's true Church, certain men arose who began to lead away followings after themselves. Perhaps they were sincere at first — wishing only to share with others their new-found truth. Perhaps they, like many today, only wanted to "witness" to others. But, they HAD NOT BEEN CALLED OF GOD! They let human nature, with its VANITY and LUST FOR POWER creep in. The apostle Paul was constantly being criticized by unthinking, carnal-minded people who did not really fear God's government as they should have. The Corinthians were accusing him of being covetous of what they supposed was their money (which was not theirs, but Gods). The whole underlying theme of Paul's second letter to the Corinthians was concerned with this problem. "Mine answer to them" he had said in the first letter, "that do examine me is this, Have we not power (authority) to eat and to drink?" (I Cor. 9:3-4). He then proved the ministry should be supported from God's tithes. The entire first chapter of Galatians is Paul's affirmation of the DIVINE AUTHORITY with which he spoke and wrote. The important thing to realize is that this defense was necessary only because of the false teachers and "leaders" who were teaching the people — leading them in humanly devised "ideas" and traditions — trying to bring discredit upon God's true ministers. It is part of your nature to want to be important, well thought of, and approved by other people! It has been said the busier a man becomes, and the more he accomplishes, the more criticism he will receive. God's word certainly affirms that statement! Jesus Christ was the busiest, and, at the same time, the most criticized man who ever lived. In some cases even the true ministers of God grew luke-warm, and dropped out of the Church. "For I know this," Paul said to the Ephesian elders "that after my departing shall grievous wolves enter in among you, not sparing the flock. Also of YOUR OWN SELVES shall men arise, speaking perverse things, to draw away disciples [students, learners] after them" (Acts 20:29-30). Paul told the young evangelist, Timothy, "Now the Spirit speaketh expressly, that in the latter times [now] some shall depart from the faith doctrine, body of beliefs, giving heed to seducing spirits, and doctrines of demons" (I Tim. 4:1). After describing the very conditions which will be extant during this time in which YOU LIVE — Paul, in his second letter to Timothy, warned, "But evil men and seducers shall wax worse and worse, deceiving, and being deceived (II Tim. 3:13). Remember, these letters to Timothy were concerned primarily with Church Government. Never forget even false ministers APPEAR, as the ministers of Christ. "For such are false apostles, deceitful workers, transforming themselves into the apostles of Christ. And no marvel, for Satan himself is transformed into an angel of light. Therefore it is no great thing if HIS MINISTERS also be transformed as the ministers of righteousness, whose end shall be according to their works" (II Cor. 11:13-15). Peter was not unaware of the undercurrent toward apostasy that was beginning then. He wrote, "But there were false prophets among the people, even as there shall be false teachers among you, who privately shall bring in damnable heresies, even denying the Lord that bought them, and bring upon themselves swift destruction" (II Peter 2:1). Paul had said the "falling away" from true doctrine was a mystery of iniquity, or LAWLESSNESS, that was beginning in his time! (II Thess. 2:7). The entire second chapter of Peter's second letter is a grave warning against false teachers. Notice, however, that there is always ONE THING THESE TEACHERS HAVE IN COMMON. Even Korah, and the ones he led with him in his rebellion against the authority of Moses, showed the same traits (See Num. 16:1-3). "But chiefly them that walk after the flesh," who are concerned about the PHYSICAL SENSES, and the fleshly, carnal sensations, the vanity they might have in leading others — becoming their teacher — the popularity, or the money and the security they covet — "in the lust of uncleanness, and despise government" [AUTHORITY, RSV] (II Pet. 2:10). "Presumptuous are they," continues Peter (II Pet. 2:10). Yes, they are always presuming to be a self-appointed leader over others, "self-willed, they are not afraid to speak evil of dignities... but these, as natural brute beasts, made to be taken and destroyed, speak evil of the things that they understand HOT; and shall utterly perish in their own corruption..." (II Pet. 2:10-12). Surprising though it may sound — some individuals are not afraid to deliberately misrepresent, and to CLAIM they represent The World Tomorrow program, or The Plain Truth magazine. There have been cases of some deliberately lying, simply because they know the scope and power of this work of God — and wish to begin to SET THEMSELVES UP as TEACHERS when there has been no calling of God! God prophesied His true sheep would be SCATTERED, and FEW, the "salt of the earth" — not the great, organized, politically powerful machines of the world. It is because of this that many begin to yearn for physical fellowship with other human beings of like belief. This is natural. It is good. But, it is also something to be WARNED ABOUT FIRST! "BEWARE OF MEN!" said Jesus Christ (Matt. 10:17). And remember our first fellowship is with Christ! (I John 1:3). Those who begin to teach others apparently do not even faintly begin to realize the GRAVE RESPONSIBILITY of such an action. It is because the true ministers of God must labor in TEACHING OTHERS the WAY TO SALVATION — telling them of the things pertaining to ETERNAL LIFE, that God lays such a heavy responsibility on them. Notice Peter's exhortation: "The Elders which are among you I exhort, who am also an elder... feed the flock of God which is among you... neither as being lords over God's heritage, but being ensamples to the flock" (I Pet. 5:1-3). To cause another human being to LOSE SALVATION is the most dastardly act a person can commit! Notice what Jesus said of such an act: "But whoso shall offend one of these little ones which believe in me, it were better for him that a millstone were hanged about his neck, and that he were drowned in the depth of the sea. Woe unto the world because of offences (causing another to stumble — to go back into sin!) for it must needs be that offences come, but woe to that man by whom the offence cometh!" (Matt. 18:6-7). A minister can be responsible for converting people — for convicting them of sin and bringing them to Christ in real DOWN TO EARTH REPENTANCE! Or, he can, by teaching false ideas — by setting himself up as a leader when God has not called him — send people straight into the lake of fire — Gehenna fire! But it is not only those who deliberately masquerade as the ministers of God, but ANYONE, be he false minister, professing teacher, deliberate liar, or INNOCENT LAY MEMBER simply trying to "do good" to others, but who teaches doctrines which LEAD THAT PERSON ASTRAY — who comes under the condemnation of the word of God — which says WOE unto that man! (Luke 17:1-2). It is GOD who chooses and calls His servants (Eph. 4:11; I Cor. 12:38). The WAY He calls them needs to be definitely understood! Notice, Jesus said to His disciples, "Ye have not chosen me, but I have chosen you, and ordained you..." (John 15:16). When He was walking by the Sea of Galilee, He said to Peter and Andrew, "FOLLOW ME, and I will make you fishers of men" (Matt. 4:19). Notice, NOT ONE of Jesus' disciples whom He called and ORDAINED to the ministry CHOSE THEMSELVES! I want you to think very carefully about this next statement! It constitutes a great principle of God's word — and a vitally important KEY to be used in God's true ministry! THERE IS NOT ONE SINGLE EXAMPLE — ANYWHERE IN THE BIBLE, WHERE A CALLED AND CHOSEN SERVANT OF GOD CAME forward and VOLUNTEERED for THE OFFICE! Moses argued that he was unfit for the job, Jeremiah said he was too young, Jonah ran away, Samuel was directly called of God, David knew nothing until Samuel announced it to him. All of the prophets say, "The Word of the Lord CAME unto..." them, not that they volunteered for the office! Jesus called and appointed His true disciples. Paul was struck down by a miracle. Paul "took" Timothy unto him, and so it is throughout the history of God's Church. My father fought vigorously against the truth of God before He was finally called. But Jesus said, "Wherefore by their fruits ye shall know them! (Matt. 7:20). The Scriptural QUALIFICATIONS imposed upon any person whom God is calling to the ministry are so absolutely RIGID. One great principle that seems so difficult for some few to understand is that the Creator who gives us every breath of air we breathe accomplishes His plan here below — yes, and even governs His Church — THROUGH HUMAN BEINGS — HIS INSTRUMENTS! God is now sending the Gospel of His soon-coming Government into many parts of this darkened world. But He is not yet shouting with His own booming, earth-shaking voice — He is sending the Gospel over the airwaves by the voice of HIS HUMAN INSTRUMENT, Mr. Armstrong! He is seeing to it that YOU are receiving this magazine, to feed and nourish you in His truth, to warn you of impending dangers, to try to HELP each hungry "babe in Christ" gain an entrance into His glorious Kingdom. But the magazine is written, edited, typed, printed, and mailed by human instruments. It is the same in calling His ministry! Many have assumed the apostle Paul was the exception to the rule that ministers were always ordained through HUMAN INSTRUMENTS, by the laying on of the hands of the ministry! Read the account of Paul's ORDINATION by human instruments with your own eyes! Turn to Acts, the 13th chapter. Here, you see the gathering of the elders at Antioch, and the ordination of Paul. Paul had been struck down on the road to Damascus, blinded, and made willing to receive God's Spirit through a real REPENTANCE! He was able to "preach Christ" to the Jews at Damascus then, "proving that this is very Christ!" (Acts 9:20 and 22). But notice that Paul was not a MINISTER — he was not an active member in the Governmental body of the Church — he was merely doing what ANY of YOU should be able to do — "... be ready always to give an answer to every man that asketh you a reason of the hope that is in you with meekness and fear" (I Pet. 3:15). But notice — it entails giving an ANSWER TO THOSE THAT ASK — not the kind of door-to-door "witnessing" that is being done by many today. I remember a time when I was eating a meal in a restaurant. Two women entered, unnoticed in the crowd of others finding booths or chairs, and gradually made their way toward the rear of the small, somewhat crowded restaurant. Finally, taking up positions just behind the booth in which I was seated, with another minister, they began to SHOUT — at the TOP OF THEIR LUNGS, "FIRE! FIRE! FIRE! is burning in the gates of HELL for every lost sinner!" The near disastrous results could have meant a severe lawsuit for both of them. The people in the restaurant were so shocked by the "FIRE" cry they didn't really hear the rest of it — which was just as well — and some of them began to hastily jump up to flee the place! They thought a customer had discovered a fire! Scenes of this type bring a REPROACH on the precious word of God! Should these women have been "witnessing"? Mr. Meredith answered this question, in the article "Should Women Preach?" appearing in the February-March, 1955, Plain Truth. Your Bible says NO! "Let your women keep silence in the churches; for it is not permitted unto them to speak; but they are commanded to be under obedience, as also saith the law. And if they will learn anything, let them ask their husbands at home: for it is a SHAME for women to speak in the Church" (I Cor. 14:34-35). After the short preaching at Damascus on the part of the apostle Paul, that Jesus was the true Christ, Paul went to Arabia (Gal. 1:17) and returned to Damascus (vs. 18). After three years (vs. 18), Paul then went down to TARSUS, the city of his birth. Prior to this time, however, Paul had been with the other apostles in Jerusalem, after Barnabas had told them of the miraculous way in which God struck him down. He learned from them how they carried out their offices in the government of the Church: "And he was with them coming in and going out at Jerusalem" (Acts 9:28). PAUL was TRIED AND PROVED in the actual ministry. Notice how Barnabas, also a disciple of the Church, later took Paul with him when he went to Antioch, and they taught many people for another additional YEAR (Acts 11:25-26). It was only after this time of actual ministerial experience and training — having been alone with Christ in the desert of Petra — having been under the direct supervision of the headquarters Church at Jerusalem, then taken with Barnabas who was older in the faith, to Antioch, that God finally led His servants to ordain Paul! Notice, as the elders were ministering to the Lord at Antioch, they were FASTING (Acts 13:2). During this time as they were in fasting and prayer — the "Holy Spirit said, 'Separate me Barnabas and Saul for the work whereunto I have called them'" (vs. 2). God's Holy Spirit directed the minds of His praying, fasting servants — His HUMAN INSTRUMENTS! For example, the Holy Spirit led Mr. Armstrong to separate Herman Hoeh, Roderick Meredith and others unto the work whereunto God had called them! He directly REVEALED to Mr. Armstrong — who could see by the FRUITS being borne of these men, by their consecration and dedication to God's work, by the need of the work — by their spiritual leadership and qualifications that God was doing the calling! And so it was with the apostle Paul! The ministers were told to "separate" Paul! A setting apart or a "separation" for an office is just another word for ORDINATION! Notice what happened! "And when they had fasted and prayed (as in all cases of ordinations), and LAID THEIR HANDS ON THEM, they sent them away" (Acts 13:3). There is the record of the ordination of the apostle Paul by HUMAN INSTRUMENTS, in the exact same way God always calls and chooses His true ministers — after conversion, a number of years of study and preparation, actual field testing and proving in the ministry, and final ordination when GOD shows His ministers His will! Some, however, who are always looking for ways to GET AROUND the set and established ways of their Creator and RULER, want to "have their own way," and so try to achieve their own goals by wrong means! Frequently, some will get a certain "feeling" they are being called to the ministry! Setting their heart on the ministry, they DECIDE God has called them to be His stewards — and begin to FORCE THEMSELVES IN! Notice, they have NOT been trained — have NOT fulfilled the divinely imposed Scriptural qualifications, have NOT been observed, tested and proved by God's true ministers — they merely "make up their minds" and then VOLUNTEER! BUT NONE OF GOD'S TRUE SERVANTS HAVE EVER VOLUNTEERED ON THEIR OWN. Others have a "dream" and then come to the ministers, telling them God IS calling them to the ministry! But WHO HAD THE DREAMS IN THE BIBLE? The one being called? Or the human instrument used in the actual calling? Notice! In the case of the apostle Paul, the miraculous vision on the road to Damascus WAS ALSO COUPLED WITH A VISION WHICH APPEARED TO ANANIAS — a truly converted man, who was already in God's Church — whom God used as the instrument in baptizing Paul. Ananias DID NOT ordain Paul — he merely baptized him! God's true servants are not called by weird dreams and visions which God keeps HIDDEN from His already-called and ordained officers of the Church. A lay member will not be called to the ministry without the MINISTERS being the FIRST ONES TO RECOGNIZE IT — BEFORE THE LAY MEMBER EVER DOES! The Bible is also explicit on a whole GROUP of men who "volunteered" for the ministry, or a prophetic office, or a position of leadership in the congregation! "Now Korah... rose up before Moses, with certain of the children of Israel... against Moses and against Aaron, and said unto them, 'You take too much upon you, seeing ALL the congregation are holy... wherefore then lift ye up YOURSELVES above the congregation?" (Num. 16:1-3). Notice! Moses and Aaron were accused of having APPOINTED THEMSELVES and "lifting up themselves" over the congregation! You and I know, however, that Moses and Aaron were called of God! But — as is nearly ALWAYS the case when a presumptuous person tries to USURP authority, he repudiates the office of the one in the already-established position, and accused that person of having arrogated the office to himself! Let's never let this happen to any of us! Notice the fearsome END of Korah! "...the ground clave asunder that was under them, and the earth opened her mouth, and swallowed them up, and their houses, and all the men that appertained unto Korah, and all their goods... and they perished from among the congregation" (Num. 16: 31-33). Satan "volunteered" to take over the office of God! All the FALSE prophets set themselves up, claiming to be the true prophets of God! Adonijah, Solomon's half-brother, tried to set himself up as King over Israel, and was finally killed for his presumptuousness! Simon, the sorcerer, wanted the power of God, and tried to buy it with money! Peter said, "Thy money perish with thee, because thou hast thought that the gift of God may be purchased with money... thy HEART IS NOT RIGHT in the sight of God" (Acts 8:20-21). Any person who tries to arrogate to himself an office of the ministry joins ranks with Korah, with Adonijah and all the false prophets, and with Satan the Devil himself! REMEMBER! There is not one single example in your Bible where the true ministers of God VOLUNTEERED OF THEMSELVES FOR THE OFFICE! There are many thousands today who, even in innocence, have taken to themselves the prerogative of teaching God's word. And, it is a great SHAME to state the further truth — that HUNDREDS AND HUNDREDS OF "TEACHERS" OF THE BIBLE TODAY KNOW LITTLE IF ANYTHING ABOUT THE BIBLE! THEY ARE IGNORANT OF IT, GROPING IN THE DARK, and because they have not realized the GRAVE WARNINGS about this very thing in the Bible itself — are heading for an awful END unless they REPENT of it, and CHANGE THEIR WAYS! James warns, "My brethren, be not many masters, knowing that we shall receive the greater condemnation" (Jas. 3:1). In the King James English, this verse is a little obscure, but by taking other translations, and the original Greek, the rendering, in modern English, is this: "Do NOT MANY OF YOU BECOME TEACHERS, KNOWING THAT WE (WHO TEACH GOD'S WORD) SHALL RECEIVE GREATER JUDGEMENT! " The entire third chapter of James — famous as the chapter about the tongue, and evil speaking of man — is directed as a warning to THOSE WHO DARE TO TEACH THE BIBLE TO OTHERS! Jeremiah was a prophet of God. God used Him to prophesy against other prophets — both past, PRESENT and FUTURE! In Jer. 23, a startling prophecy is revealed concerning the' end times. You are now living in these end times — the time just before the INTERVENTION of Almighty God, and the return of Jesus Christ to this earth! Let's notice the dire warnings contained in this prophecy about false teachers! "WOE be unto the pastors that destroy and scatter the sheep of my pasture! saith the Lord" (Jer. 23:1). Subsequent verses show God will bring the evil of their own doings upon them (even though they preach against any "works" ir is WORKS they'll be JUDGED BY!). But it is not only those who style themselves ordained ministers this prophecy is directed to. Notice! "I have heard what the prophets said, that prophesy lies in my name, saying, 'I have dreamed, I have dreamed'" (Jer. 23:25). They say, "I know the answers! I can tell you what the Bible means" — but they DON'T KNOW! So they're not all standing in a pulpit, or holding an office — but some are simply teaching their neighbors! When God has NOT CALLED THEM! Here is what God says: "Behold, I am against the prophets... that use their tongues, and say, He saith. "Behold I am against them that prophesy false dreams... and do tell them, and cause my people to err by their lies, and by their lightness; yet I sent them not, nor commanded them: therefore they shall not profit this people at all, saith the Lord" (Jer. 23:31-32). Finally, when the KINGDOM OF GOD is established on this earth, we read: "It shall come to pass in that day, that the prophets shall be ashamed every one of his vision, when he hath prophesied; neither shall they wear a hairy cloak (marginal reading) to deceive, but he shall say, 'I am no prophet! I am a FARMER, for man taught me to keep cattle from my youth!" (Zech. 13:3-5). YES! In that day a man will aspire to be a FARMER before claiming to teach others in the name of Christ when Christ has NOT SENT HIM! To those who CHOSE FOR THEMSELVES THE MINISTRY — WHO VOLUNTEERED FOR THE JOB — WHO SET THEMSELVES UP AS TEACHERS OF OTHERS — THESE SCRIPTURES GIVE WARNING! You have read this article. You are now RESPONSIBLE for it. May God give you the grace and wisdom to be obedient to Him in ALL things!